Disturbed bowel function, including constipation, diarrhea, and bowel obstructions, commonly affects palliative care patients. 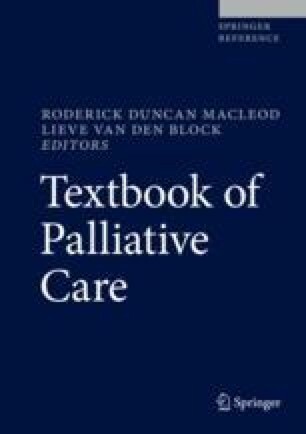 This chapter aims to summarize these problems, focusing on the current understanding of the prevalence, etiology, and palliative management. The first issue that will be discussed is the most prevalent distal gut problem of constipation. Despite the fact that the majority of palliative care patients require laxatives, the etiology of constipation in palliative care is not well described. The next topic is diarrhea, which, although less, common is still equally distressing. A systematic approach to assessment and management is recommended. Lastly, the evidence that describes the palliative management of inoperable bowel obstructions will be explored.